The Byzantine Empire began in a.d. 330, when Emperor Constantine I moved the capital of the Roman Empire to a city that became known as Constantinople, or Byzantium (modern-day Istanbul). Constantine I was impressed by the city's strategic location, notably its command of the Mediterranean, Aegean, and Black seas. The Byzantine Empire's thriving commercial trade led to immense wealth, its trade routes extending from Scandinavia and Russia to Armenia and Ethiopia. In a.d. 364, Emperor Valentinian I divided the Roman Empire into two parts—east and west—with two emperors, to facilitate the management of the vast territory. East and west, however, differed greatly, the eastern portion having a larger population and greater wealth. After the fall of Rome in the fifth century at the hands of the Germanic Goths, the eastern Byzantine Empire ruled alone. This empire lasted for over 1,100 years—until 1453, the year of the death of Emperor Constantine XI and the fall of the empire to the Ottoman Turks. During this era, costume attained a richness of color, fabric, and ornament that far exceeded the greatest days of Rome. The Byzantine culture was a complex blending of east and west. Included within Byzantine fashions are not only those styles worn in the city of Byzantium after it became the capital of the Roman Empire, but also clothing worn in regions that fell under its influence, such as Italy, Greece, and Russia. Until the sixth century, the Roman influence was still strong, with draped styles predominating the cut of dress. The tunica (a universally worn loosely draped garment of undyed wool or linen), the dalmatic (a wide-sleeved over-robe of cotton, linen, or wool for the commoners, and silk for the wealthy), and the stola (a high-belted woman's garment constructed from a folded rectangle) were the basic foundations of Byzantine style. The dalmatica evolved from knee-length in the early part of the empire (sixth to tenth centuries) to floor-length (tenth to thirteenth centuries), finally resembling a Turkish caftan in the fourteenth and fifteenth centuries. From the beginning, the fabrics and colors used were strongly influenced by Persian, Assyrian, Egyptian, and Arabian sources. As time passed, these eastern styles of costume began to assert themselves in the form of trousers, footwear, head coverings and, above all, decoration and jewelry. Most of our knowledge of Byzantine fashions comes from surviving mosaics and sculptures. Clothing artifacts reveal remarkably intricate, elaborate brocaded fabrics with jeweled surfaces. These brocaded fabrics gave a new stiffness and luminosity to garments—a departure from the soft wool and linen that characterized Roman drapery. The Emperor Justinian introduced the manufacture of silk to Constantinople in the sixth century. Silk fabric allowed for the use of brilliant colors—jewel-like reds, blues, yellows, greens, and gold (the privilege of wearing purple was limited to emperors and empresses by law). A uniquely Byzantine article worn at court was the tablion (sometimes called a claims), an ornamental jewel-encrusted, rectangular piece of fabric inset on men's and women's cloaks. The tablion identified the wearer as a member of the royal house or court dignitary. Another unusual garment was the Persian-derived maniakis, a separate collar of gold-embroidered, jewel-encrusted fabric. Byzantine dress typically covered the arms and legs, sleeves extending to the wrists. 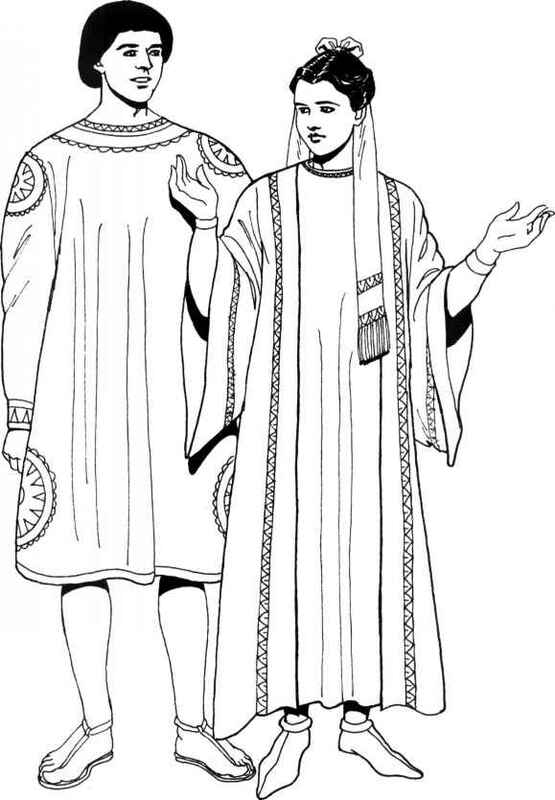 After the eighth century, the lorum was introduced—a long scarf that was draped around the body, reminiscent of the Roman toga that it had replaced. The lorum was generally made of silk or gold cloth and was heavily jeweled, indicating the wearer's status. 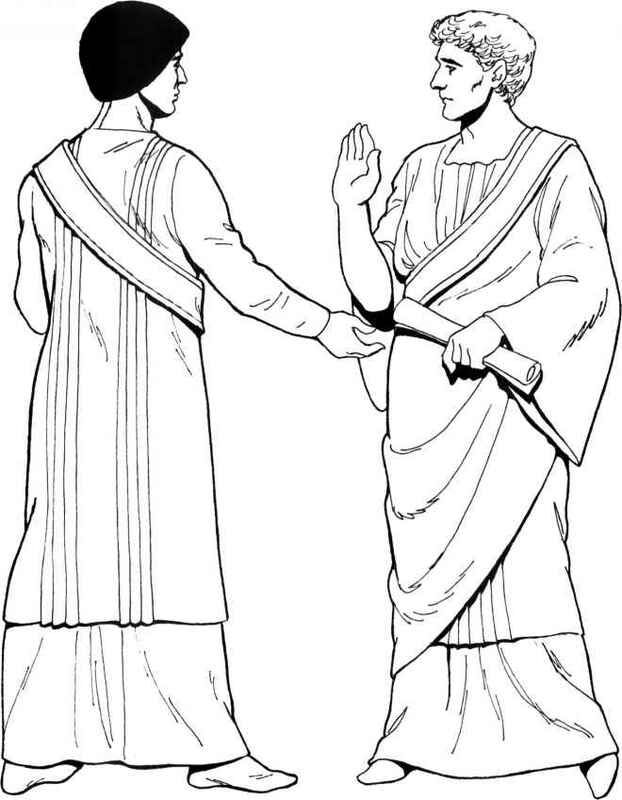 Men of means draped themselves in a rich dalmatic with a tablion placed on the left front edge. Women wore a stola (palla) over their long tunicas, using one end of the garment as a head covering. Both men and women fastened their mantles on the right shoulder with an ornate jeweled clasp called a fibula. The camisia, an undergarment made of linen or silk, was worn beneath the tunica, protecting the rich fabrics of the outer garments from body oils and perspiration. 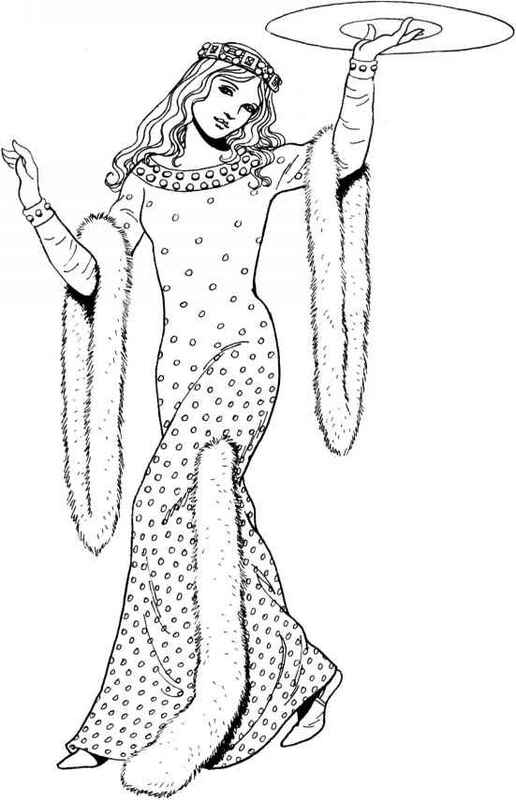 The long tunica evolved into the gunna (gown). In the latter centuries of Byzantine rule, a short shirt with long dolman-style sleeves, called a juppe, was worn over long tunicas. Elaborately designed jewelry was a hallmark of the Byzantine era. Pearls were plentiful and used lavishly with diamonds and other precious gems; eventually, colored glass beads and tiny mirrors were added to decorative embroideries. Women enveloped their hair in a coif of silk or net worked with pearls. A favorite motif in jewelry and fabrics was pairs of birds (see pages 26 and 39). Sandals, standard footwear in Roman days, were still worn, but soft ankle-high boots—calcei—were the preferred footwear of the wealthy. The boots were generally made of soft, brightly colored leather, often embroidered and jeweled, and had long, pointed toes. The Byzantine empire made two important contributions to western fashion. In the third century, its weavers began using shuttles to produce patterned fabrics. Later, in the sixth century, Emperor Justinian initiated the raising of silkworms from the cocoon. Under his aegis, silkworm eggs and seeds of the mulberry bush, concealed in hollow bamboo staffs, were brought into Byzantium by two Persian monks. The Byzantine mode of dressing became more and more sumptuous until the fall of the empire; its influence is evident throughout the Medieval and Renaissance periods of European fashion. In addition, it provided the foundation for the liturgical costume of both the eastern and western Christian churches, particularly those of Russia. Emperor Constantine I, the founder of the Byzantine been gathered from surviving sculptures. The intricate empire (ruled a.D. 324-337), is shown here with his geometric patterns that embellish their garments are mother, Helena. Information about their costumes has typical of the Byzantine era. According to legend, Constantine I (at left) dreamed that an angel told him to go to battle under the Christian cross to achieve a victory. The emperor followed the angel's advice and was victorious, his success leading to his founding the Byzantine empire. Constantine's mantle and tunica were depicted in bright primary colors in Byzantine art, the angel's (at right) in pastel tones. The mantle is fastened in typical style over the right shoulder with a jeweled clasp. Constantine wears decorated slip-on shoes. Christian Commoners cloak, fastened at his right shoulder. Both have multicolored geometric embroidered trim on their garments, she at the neck, sleeves, and waist, he at the sleeves. Fourth-century Byzantine Wc Left: The woman is wearing a brightly colored long stola decorated with gold embroidery over a long-sleeved tunica. Her palla, falling from a diadem, would have been constructed of sheer linen or silk. Right: The and Civil Official man, a civil official, wears a short, light-colored tunica with multicolored embroidery. His mantle of dark material has a decorative tablion. He wears light-col-ored stockings and brightly colored soft leather boots. The father and son depicted here wear short linen camisias. Left: The boy's camisia was probably his "dress-up" wear; the vertical stripe appears on matching stockings. Right: The father's light-colored camisia ristian Commoners is worn for work, doubling as an undergarment when he dresses up in an over-tunica. His boots—calcei—are made of soft leather. When working in the fields, he probably dispensed with stockings. 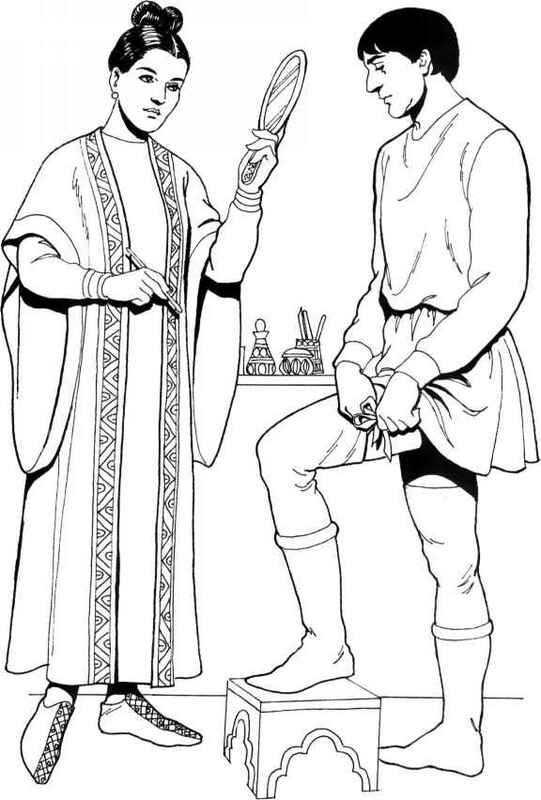 In the early years of the Byzantine empire, men did not always wear stockings. Left: The man's tunica has embroidered trim. He wears leather thong sandals. Right: The woman wears a brightly colored dalmatic antine Couple with a multicolored, geometric-patterned, embroidered trim and a matching head scarf. Women's shoes were typically red throughout most of the Byzantine period. 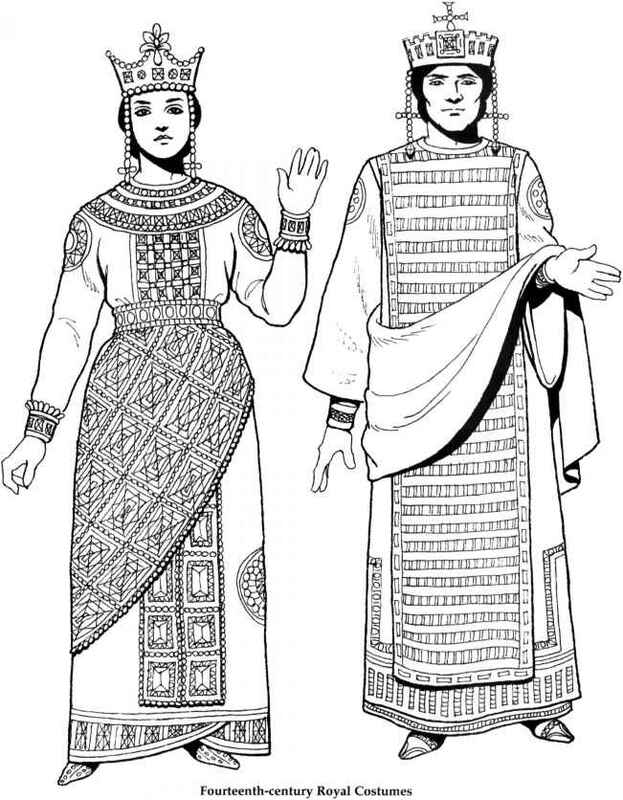 Fourth-century Royal Couple Left: He wears a brocaded silk tunica under a dark and shoes. 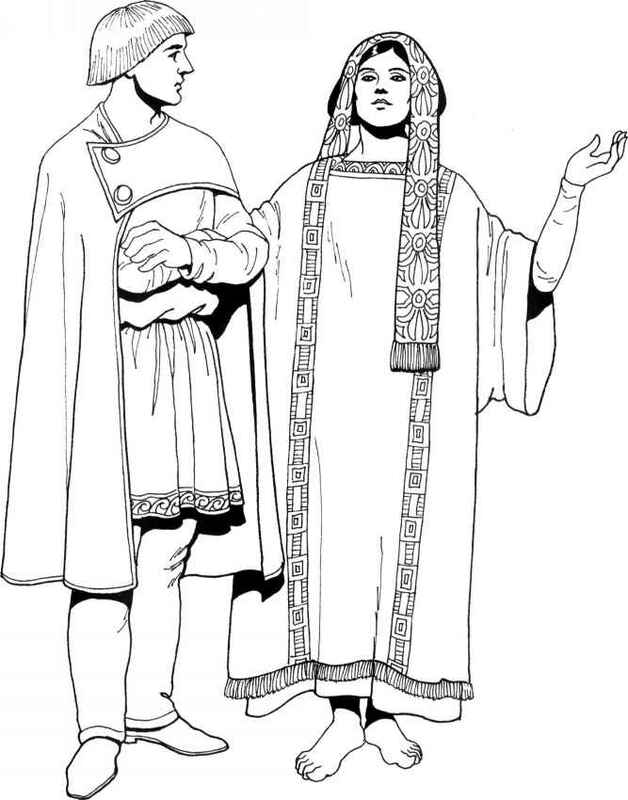 Right: She wears a pale silk camisia under a cloak, fastened with a fibula. He has on dark stockings long tunica of brightly colored silk and a dark mantle. Fourth-century Churchgoer and Lady of Rank Left: This religious woman wears a palla with fringed lady of rank wears a dalmatic with embroidered edging and embroidered detail over a stola. Right: The detail. She also wears a palla. 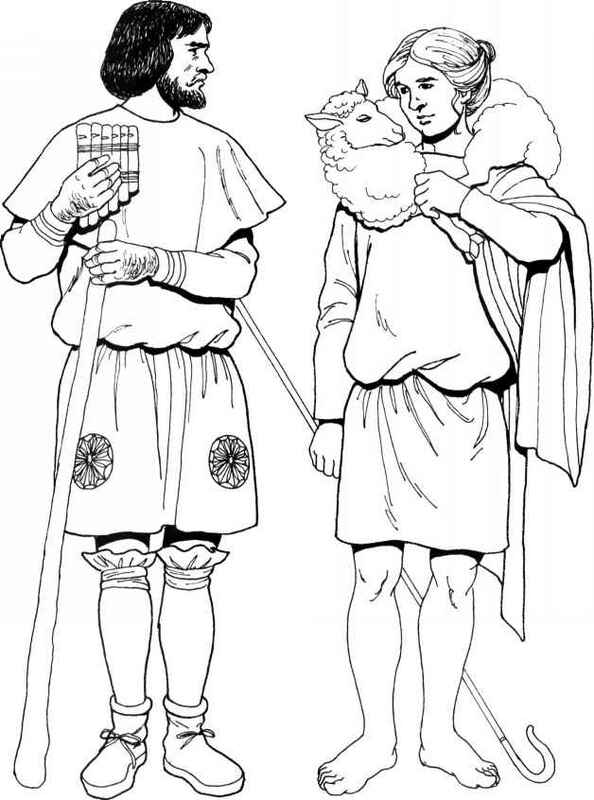 Two Fourth-century Shepherds Left: This shepherd wears a short medium-colored tuni- well as ankle-high leather boots. Right: The young man ca with embroidered decorations over a light-colored is dressed in a long-sleeved short tunica in a medium camisia. He wears long stockings bound to the leg, as color and has thrown a dark mantle over his shoulder. Shown here are an officer and a foot soldier. Left: The officer has a tooled-metal helmet and lorica (body armor). His sleeves and skirt are of tooled leather as well, and his trousers are made of pony skin. He wears r Roman Warriors a brightly colored wool mantle and leather boots. Right: The foot soldier wears a short-sleeved woolen tunica over a linen camisia and wool trousers. He wears leather boots and a metal helmet. Emperor Arcadius and Warrior Left: Emperor Arcadius (ruled 395-^408) is shown here wears soft leather boots over bare legs. 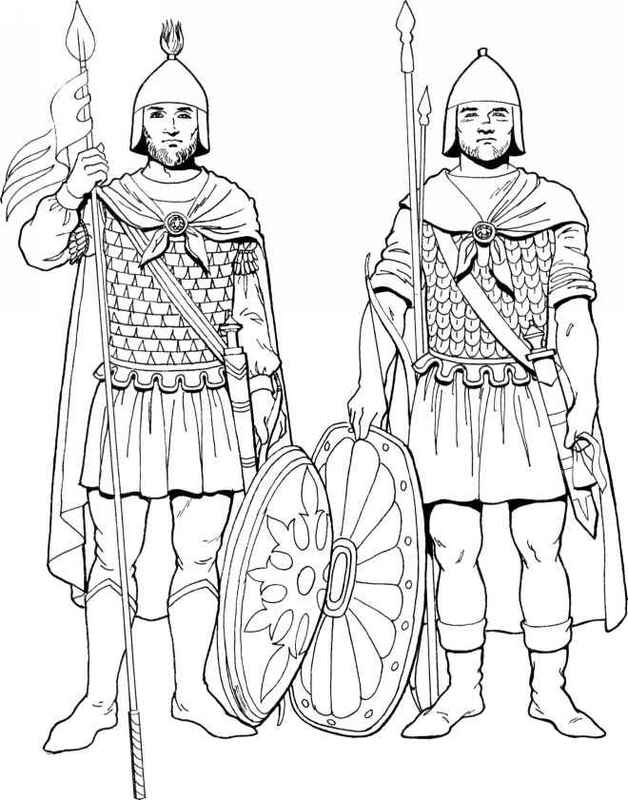 Right: The war-dressed in a white camisia, worn under a woolen, silk- rior wears a linen camisia, leather lorica, skirt, and arm embroidered tunica and a polished metal lorica. He bands. He has on wool stockings and leather shoes. Emperor Arcadius Left: Emperor Arcadius is dressed in a light-colored tunica trimmed in gold and multicolored embroidery. His mantle is dyed a rich royal purple and has a gold-embroidered lorum; it is fastened with a large fibula. and Serving Girl Right: The serving girl is dressed in a brightly colored jupe with colored embroidery trim, worn over Persian-style trousers with embroidered front panels. Her felt hat matches the trousers in color. brightly colored silk tunica and a palla of royal purple. Right: Her son, Valentinian III, is wearing a brocaded tunica, as well as a brocaded mantle fastened with a fibula. His stockings and slippers are brightly colored. Fifth-century Evangelist and Warrior Left: The evangelist is dressed in a dark tunica with over a leather apron and white camisia. He has leather light trim worn under a dark mantle with an embroi- guards on his upper arms and wears leather shin dered cross. Right: The warrior wears a metal lorica guards over his soft leather boots. Phrygian cap is made of brightly colored felt. Right: The noblewoman wears an embroidered dalmatic over a long camisia. Her flowing silk palla is the same color as her camisia. Theodora belt. Her palla is made of sheer silk edged with teardrop pearls. Right: The empress wears a semi-circular palla, edged with pearls and decorated with an embroidered religious tablion. Her coif and collar feature large pearls and precious stones. Courtiers leather. Right: The woman wears a long, patterned tunica with embroidered patches. Her palla is also made of patterned, brocaded silk. On her head she wears a light-colored rolled-brim turban. A cavalryman and a foot soldier show the subtle differences in military costume. The cavalryman wears long, fitted sleeves with leather arm bands. His cloak is shorter and he wears hose, whereas the foot soldier is nan and Foot Soldier bare legged; the cavalryman's shield is smaller than the oblong one carried by the foot soldier. Their helmets are generally the same, but the cavalryman has a feather crest. Seventh-century Warrior and Townswoman Left: The warrior wears a dark wool cloak and a dark shoes. Right: The townswoman wears a light-colored felt cap with light edging. He wears a leather tunica camisia under a pale cloak with embroidered neckline, and skirt, bare legs, light-colored socks, and dark She wears soft red leather shoes. Courtier and Priest and tablion and is fastened with a fibula. He wears tall leather boots with open toes. 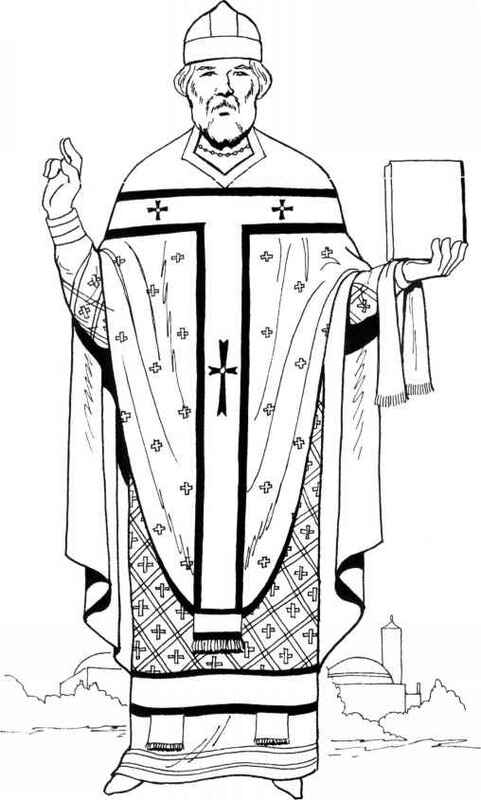 Right: The priest wears a long camisia under his tunica; the circular mantle is topped by a lorum embroidered with crosses. Left: The townswoman wears a plainly cut, natural-colored dalmatic-style tunica over her linen camisia. Her hair is bound in a linen coif with a woolen cap. 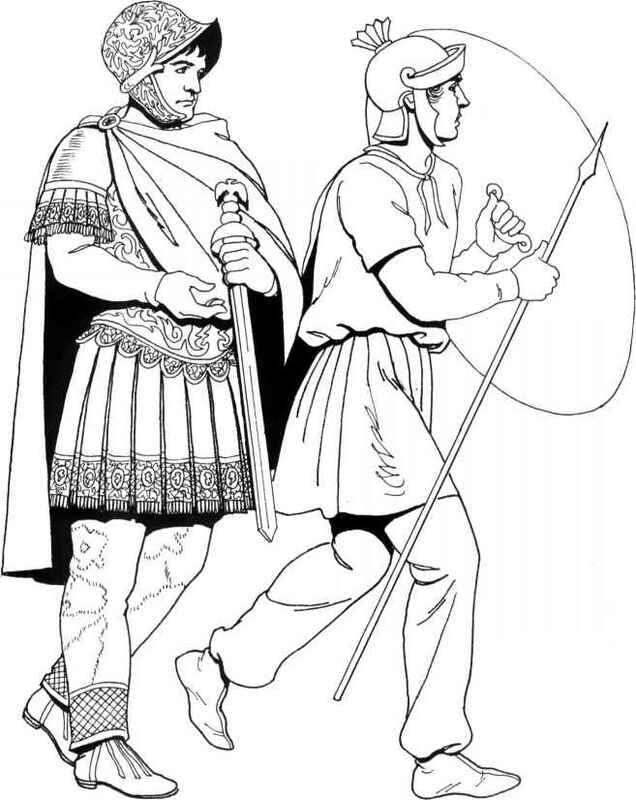 Right: The foot soldier wears a mail lorica with leather strips for skirt and shoulder guards over his linen camisia. His legs are bare, and he wears leather high-topped sandals. His lorica has leather shoulder straps, which are held down by a band of cloth wrapped around the chest. He also has on a short cloak, and he wears a metal helmet. Both of these ninth-century men wear short tunicas delettes. The man on the right wears leather boots and with embroidery trim over loose cloth hose. The man on hose tied with fabric garters. Again, their costumes the left wears a short cloak; his leather-soled shoes are would be made of subdued colors derived from natural secured to the leg with a wrapping of leather ban- herbal dyes in shades of tan, soft green, and pale yellow. These images of Emperor Romanus II (ruled 959-963) and his first wife, Empress Eudokia, are derived from a late eleventh-century ivory carving, once thought to depict Romanus IV and his wife, Empress Eudoxia. Here, the emperor and empress wear splendidly ornate costumes embroidered with pearls. Their crowns are embellished with ornamental pendants. Otto's court wear robes of simple, barely embellished design. The man's cloak is dark; his pale tunica has jeweled, gold-embroidered trim. The woman wears a dark robe with gold banding and a light-colored palla draped over the shoulder and wrapped about the waist. Emperor Nicephorus III and his Empress multicolored jeweled lorum is wrapped across the emperor's chest and hips. The empress has a jeweled collar and jeweled woman's version of the lorum wrapped around her hips. Royal Robes over a white, long-sleeved camisia, a metal lorica, a short tunica with embroidered trim, and cloth stockings. His boots are leather, studded with jewels. The women of the upper classes were rarely seen in public; nevertheless, the robes that they wore at home were constructed of fine fabrics and were richly jeweled and embroidered. On the right, the woman is depicted jer-class Woman almost entirely covered by her palla, a garment required when she left the home. The palla was generally of a very dark color, whereas the gown would have displayed brighter, more jewel-like tones. Merchant and Monk colorful medium-height stockings and leather shoes. 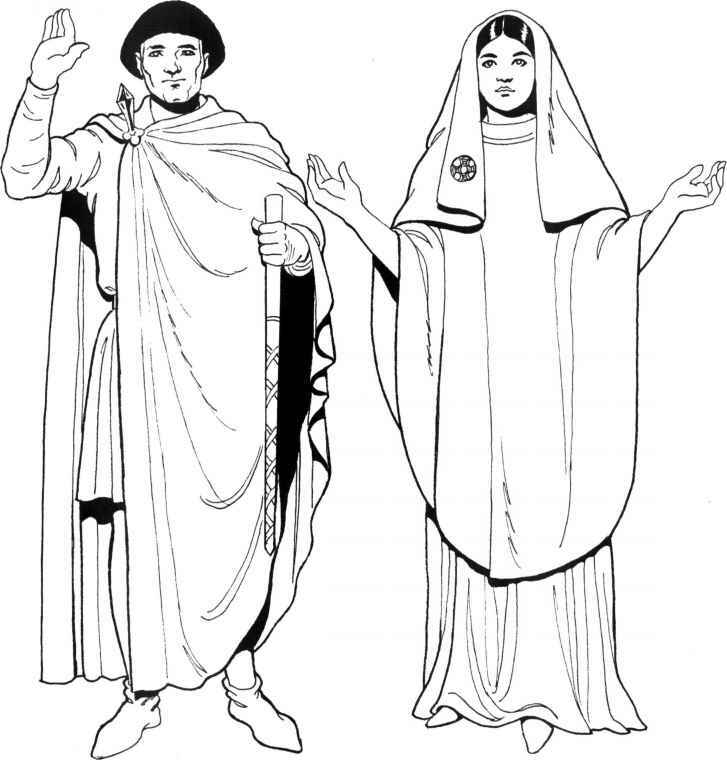 Right: The monk's garments consist of a dark mantle, a light-colored short tunica with embroidered medallions, dark cloth stockings, and leather shoes. What is a byzantine gold cloth? How the byzantine empire influenced dress? What is a palla in byzantine? What colors did byzantine warriors wear? What kind of clothing would Byzantine Emperor Justinian wear? 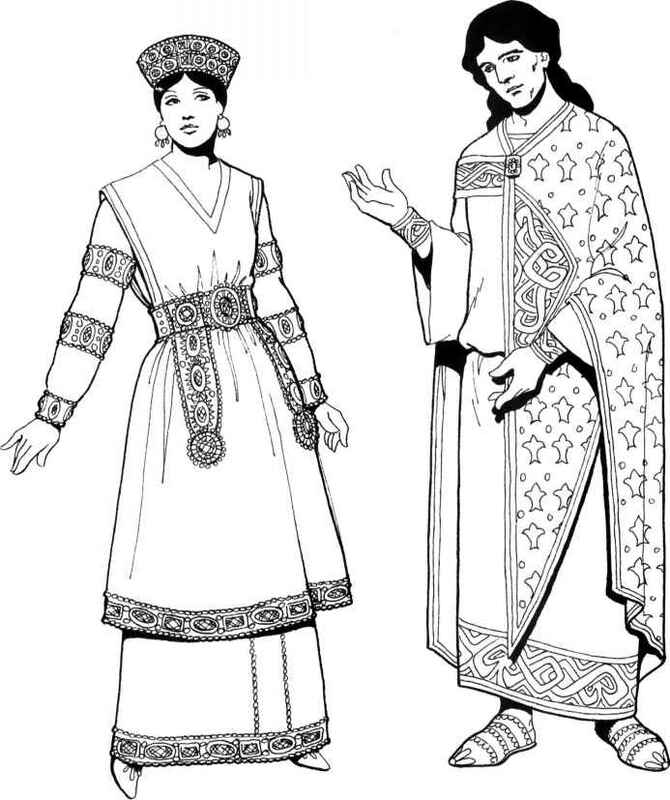 Did the byzantine and persian have the same clothing styles? Who made thebyzantine emperors clothing?